Tips and tricks to help you perform better on the ladder. Sometimes it’s easy to get caught up with duels and poking in Overwatch. Apart from “everyone go right,” there often isn’t too much team cohesion on the ladder. Having a plan of attack beyond the initial spawn is crucial to your team’s success and your precious SR. Map knowledge feels like an afterthought a lot of the time, with players not thinking about how group composition and positioning might change from one map to the next. I spoke with former Ronin DPS flex player, Far, earlier this week to see what his thoughts were on the various maps of Nepal. Grenade/rocket spam in tight spaces has been an FPS strategy for a very long time. The idea, in case you’re wondering, is that you’ll maximize the damage of every shot since your targets are clustered together. In Overwatch, this also means making short work of tank shields and possible deployables in the area. If your team agrees to take the fight down either hallway on Sanctum, picking Junkrat could give your composition the necessary firepower to win that first fight. Sanctum offers a lot if you know what to look for and how to press your advantage. Remember to play smarter, not harder on this map. Pay attention to his movement and positioning here. He utilizes just enough of the vertical plane, all while weaving around the elephant statue and center columns. That’s what you have to do on Shrine if you want to help your team as Pharah. Not abusing line of sight is one-way ticket to the spawn room. That’s one way to kill a push! And they say camping takes no skill. It doesn’t get prettier than that. They deny LG Evil the high ground with some teamwork and well-timed ultimates, never straying too far from each other at any time. Knowing what to do in every situation will help you improve in any game you play. 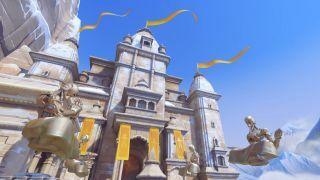 Map knowledge isn’t just some tertiary skill in Overwatch: it’s something that could possibly save you a few invaluable seconds. On Nepal, that means looking for environmental hazards, using structures to disrupt lines of sight and knowing when to stick together. If you’re looking for some inspiration, check out some pro replays on YouTube or Twitch. You might learn another clutch trick or two that you can put in your back pocket.